Specsavers and Collette Dinnigan are excited to announce -Spirited' – Collette's first ever eyewear collection for kids, exclusive to Specsavers and available in stores from 14th September. The range is made for girls who like to march to the beat of their own drum, and is designed to encourage kids to have confidence in their style and wear their glasses with pride. The collection is made up of seven ophthalmic frames, and features playful patterns that let the wearer stand out from the crowd, including checkerboard prints, jumbled spots and flower motifs that decorate the arms of cat's eye and bold-fronted frames. Timeless shapes are subtly refashioned with delicately arched brow lines, sweeping silhouettes and keyhole bridges. Collette, who was recently awarded an Order of Australia honour for her distinguished service to the fashion industry says, 'I'm really proud of my new eyewear range for children. When designing this special collection, I was thinking about petite profiles, yet wanted to make sure the range was versatile enough to fit a variety of face shapes. Most of all, I wanted to make sure the young wearer would be excited to wear their glasses with pride – whether it be at home, in the classroom, or in the playground," says Collette. 'Every care has been taken in the design stages to deliver a quality product so the wearer can focus on the important things in life without their glasses letting them down." Collette adds. The range includes elements of Collette's signature aesthetic, refashioned with children in mind. All pieces have been crafted from high quality materials with a strong attention to detail. Design features include on trend crystal acetates in tinted pink and red tones and with a signature star temple tip on each frame, the range offers unique styles in a bright colour palette. From Specsavers' perspective, the latest collaboration with Collette is a timely reminder to parents that all children should have an eye test at least once every two years. Research1 has found that almost half of Australian parents are not taking their child to have their first eye test by the time they are eight, as recommended by Specsavers optometrists. After eight can be too late to prevent some long term eye conditions, such as a squint or a lazy eye. Juan Carlos Camargo, Specsavers' Head of Frames says, 'The team at Specsavers loved working on this new range with Collette. 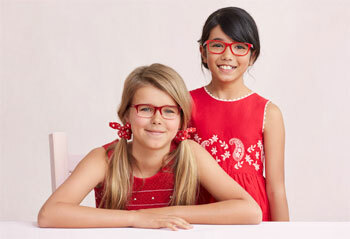 The frames are so fun and colourful, and we think our youngest customers will be very pleased with the new collection." 'We saw a gap in the market when parents and young spec wearers were calling out to see more stylish and unique frames in the younger age bracket. I believe the Collette Dinnigan kids eyewear range truly responds to what our customers have been looking for and I'm excited to see the response when the frames become available in stores." The new Collette Dinnigan eyewear range for kids will launch in Specsavers' stores nationally on Thursday September 14th 2017 and is priced from $199 for two pairs single vision.